Travel deep into the Section 6AA playoffs, and the magnitude of the games multiply tenfold with each giant step forward. Reach the semifinals and, really, there’s no need for coaches to give impassioned speeches or manufacture bulletin-board material. 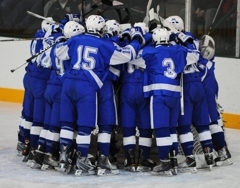 “Anyone in this big of a game is going to be motivated,” Minnetonka coach Brian Urick said about the Skippers’ section semifinal showdown with Eden Prairie. Yet, over in the Eagles’ locker room, scrawled on a white board, were two numbers. 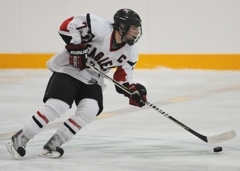 Ford, who allowed six goals a year ago in the season-ending loss to the Skippers, was flawless this time as the Eagles skated to a 4-0 triumph on Saturday, Feb. 26, in front of an announced crowd of 1,675 at Braemar Arena in Edina. With Eden Prairie playing the state’s toughest regular season schedule, top 10 team after top 10 team night after night, Ford was, at times, fighting the puck. His save percentage (.886) was lower and goals-against average (2.71) higher than in previous seasons. 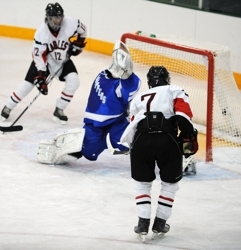 Ford flashed his vintage form against Minnetonka, the same make-it-look-easy style that took the state by storm two seasons ago when, as a sophomore, he backstopped the Eagles to the state Class 2A championship. 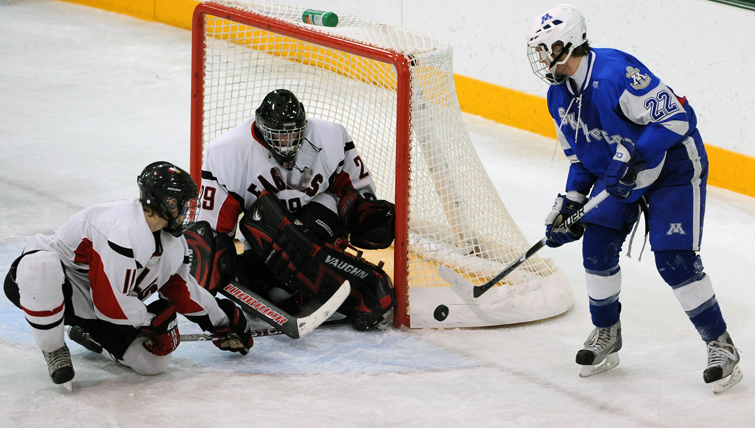 He finished with 27 saves, including nine in the first period when Minnetonka created some of its best scoring chances. Ford made just four saves in the second period, but one of them was exceedingly clutch. 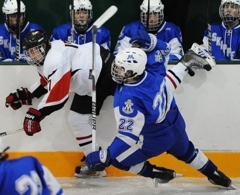 With the Eagles holding a 2-0 lead, Minnetonka’s Phil Katopodis roared down the middle of the slot with the puck and with plenty of time to pick his corner. Katopodis unleashed a shot headed for the inside of the right post, but Ford snagged the puck with his catching glove. 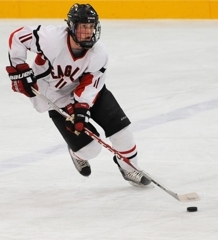 Eden Prairie scored just seconds later, as Seeler grabbed a turnover at the Minnetonka blue line and, after some nifty maneuvering, fed Kyle Rau for a goal that put the Eagles ahead 3-0. Turns out, it wasn’t Smith who posted those numbers on the white board. Ford said it was senior defenseman Dan Molenaar who provided the not-so-subtle reminder. Senior Andrew Ford made 27 saves to lead Eden Prairie past Minnetonka 4-0 in a Section 6AA semifinal on Saturday, Feb. 26, at Braemar Arena in Edina. 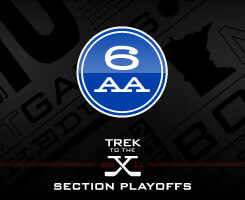 Eden Prairie advances to the section final at 8 p.m. on Wednesday, March 3, at Mariucci Arena in Minneapolis. 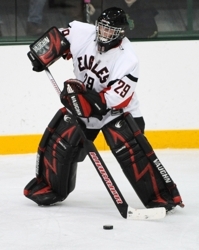 Ford, who burst on the state scene two seasons ago when he helped the Eagles win the state Class 2A championship, made 14 saves in the final period as No. 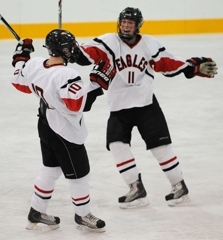 1-seeded Eden Prairie (20-5-2) withstood a final surge by No. 4 Minnetonka (17-8-2). 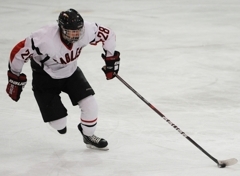 Eden Prairie led 1-0 after the first period and took command in the second, when seniors Jack McCartan and Kyle Rau scored to put the Eagles ahead 3-0. One of Ford’s best saves came moments before Rau’s goal. 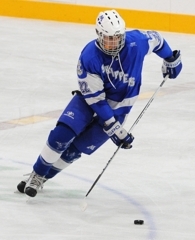 Minnetonka’s Phil Katopodis cruised down the slot and fired a wrist shot Ford snared with his glove. 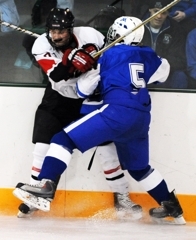 When the play went the other direction, senior defenseman Nick Seeler used a series of head fakes and some deft stickhandling to set up Rau, who was camped to the right of Minnetonka goaltender Alex Glockner. 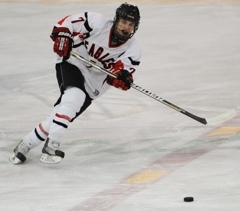 Senior Des Shavlik added an insurange goal in the third for Eden Prairie, which lost 7-2 to Minnetonka in last year’s Section 6AA final. Senior defenseman Curt Rau, Kyle's twin brother, scored the only goal of the first period on a screened shot from the point. 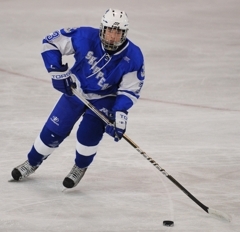 Glockner made 27 saves for the Skippers. The senior goaltender has a history of playing big in the biggest of games, and he added a page to that book with his flawless 27-save performance against Minnetonka. Ford has had his ups and downs this season while playing most of the state’s elite programs, but he looked cool and comfortable with every stop against the Skippers. The senior defenseman didn’t score, but the Nebraska-Omaha recruit did deliver the prettiest play of the night when he stole the puck at the Minnetonka blue line, walked around two Skippers and fed Kyle Rau at the side of the net for an easy goal that put the Eagles ahead 3-0 in the second period. 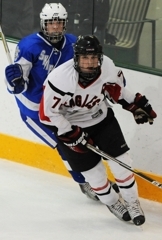 The senior faced quality shot after quality shot, wraparound attempt after wraparound attempt and was in position to thwart most every high quality Eden Prairie scoring chance. Glockner finished with 27 saves and couldn’t be faulted on any of the Eagles’ goals.